The Bell Boeing V-22 Program, a strategic alliance between Bell Helicopter Textron Inc. and Boeing, has successfully completed an initial test of the V-22 Osprey performing as an aerial refueling tanker. Adding this capability to the tiltrotor aircraft would further advance its versatility in combat, humanitarian and ship-based operations. In the August demonstration over north Texas, a V-22 equipped with a prototype aerial refueling system safely deployed, held stable, and retracted the refueling drogue as an F/A-18C and an F/A-18D Hornet flew just behind and to the side of the aircraft. 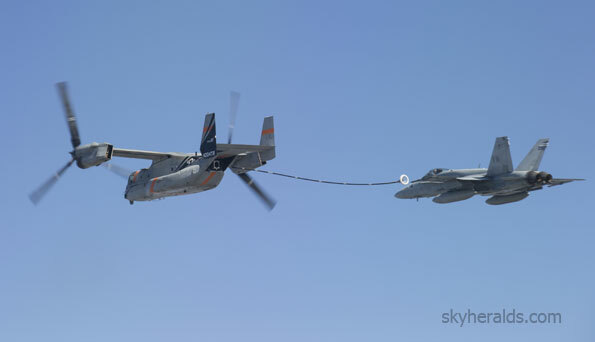 Future Bell Boeing tests will put aircraft in a fuel-receiving position directly behind the V-22, connect receiver aircraft with the refueling drogue and, ultimately, refuel a variety of aircraft in flight. The V-22 is a combat-proven tiltrotor that can fly horizontally at high speeds and high altitudes like an airplane, and take off and land vertically like a helicopter.